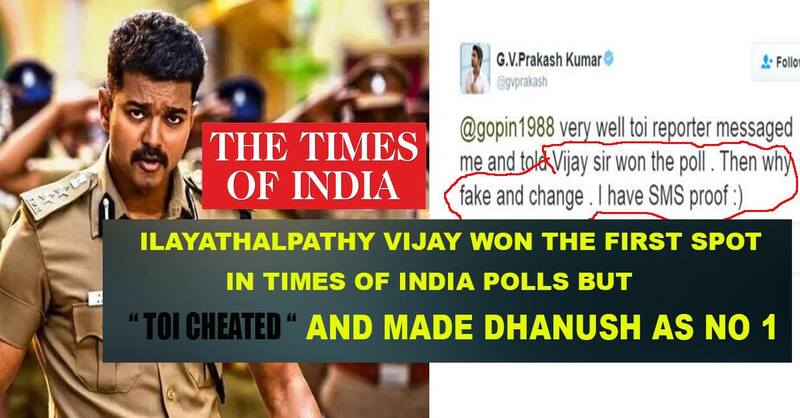 Cheap Act Times of India – Vijay won the Actual Poll: Recently Times of India conducted a Poll for Most Desirable Men & Ilayathalapthy Vijay won the first spot but Times of India cheated and made Dhanush as No 1. 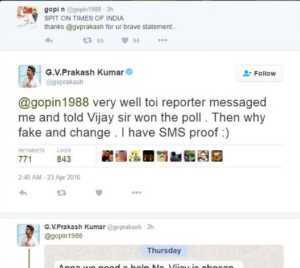 Few hours back GV Prakash tweeted and defamed Times of India on Twitter. GV Prakash has also published the WhatsApp screenshot proof in his Official Account. The truth behind this is, They wanted to have an Interview with Actor Vijay & Vijay politely rejected it. This Cheap Act by Times of India made Fans really unhappy. The story behind making Dhanush is still not yet confirmed. Screenshots are attached below as proof.